Huangshan city is located at the southernmost tip of Anhui Province. To the northeast closes with Jixi County, Shengde County and Jing County of Xuancheng region; to the northwest connects with Qingyang County, Shitai County and Dongzhi County of Chizhou region; to the southwest adjacent to Jingde Town of Jiangxi Province; and to the southeast bounders with Kaihua County, Chunan County and Linan County of Zhejiang Province. Huanghsan city lies in a subtropical, evergreen broad-leaved forest and red and yellow soil zone. The east longitude is between 171 degrees and 118 degrees 53 minute, and the north latitude is between 29 degrees 24 minute and 30 degrees 31 minute. The northernmost is in the southeast of Zhupu Town, Xi County, and the westernmost is in the west of Xinan Town, Qimen County, extending 164.14 kilometers from east to west. The southernmost is on the Lotus Peak of Xiuning County, and the northernmost is in the north of Xinfeng County, Huangshan region, extending 123.35 kilometers from south to north. The total area occupies 9,870 square kilometers. Huangshan City belongs to north subtropical region and quarter humid monsoon weather, with moderate rainfall. The four seasons are distinctly clear. The annual average temperature is between 15 degree and 16 degree. Most of the region in winter has no freezing and the frost-free period often lasts 236 days. The average annual precipitation is 167 cm. The precipitation is mainly concentrated in May or August. The hydrothermal resources are very rich, which is suitable for a variety of trees, tea, fruit trees and crops growth. Huangshan Mountain is the first batch of key national scenic spots and also a world-class tourist destination. In 1990, Huangshan Mountain was listed by UNESCO as a world natural protection of the human heritage record and has become mankind’s heritage. It has an area of about 1,200 square kilometers. The scenic area occupies 1,154 square kilometers. It’s said that this mountain was the place that Chinese ancestor Yellow Emperor practiced his moral culture, refined compounded drug and became an immortal. There are thousands of peaks, 72 of which are well-known. Among them, “Lotus”, “Brightness Top” and “Celestial Capital” are the three major ones. Their elevations reach above 1,800 meters with magnificent, majestic scenery. Different seasons have different sceneries in Huangshan Mountain. Sunrise, sunset, Buddha lights and other season landscapes have their own features. This mountain is called “natural zoo and the botanical garden world”. It’s really a paradise on earth. In addition, Cloud Valley Temple, Pine Valley Nunnery, White Cloud River, Jadeite Valley and other scenic areas attract so many tourists to visit. There are four wonders of Huangshan, and they are 1) odd-shaped pines, 2) craggy rocks, 3) sea of clouds and 4) crystal-clear hot spring. Odd-shaped pines are often grown on the peak whose elevation is between 800 meters and 1,800 meters. They’re a famous tree species in botany. Huangshan Mountain’s pines and other trees are not the same. They are mostly not growing in the soil, but deep-rooted in the dangerous rocks and cliffs. 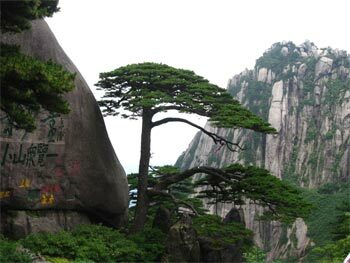 Welcoming guest pines: it is located in the east side of the Jade Screen Peak and on the Wenshu Cave. The height is about 10 meters; the diameter is about 64 centimeters; the diameter of its root is 75 centimeters; and under the pines branch is 2.5 meters high. There are two main lateral shoots which are in the middle of its trunk with 7.6 meters long stretching forwards. It seems as a hospitable host who stretches his two arms to welcome the tourists at home and abroad warmly. This pine stands for Huangshan Mountain. It’s the national treasure. Anhui Hall of Beijing Office now displays a huge iron picture “Welcoming Pine” which was drawn based on its image. Seeing-Guest-Out Pine: it’s adjacent to the road of Jade Screen Peak, standing among the green forest. One lateral shoot stretches out as if it bows to see the guests out. This is the reason why it’s called “Seeing-Guest-Out Pine”.